Hey pals! How are you doing? Hope you have enjoyed my vegetarian recipe, Dal Makhni (Black Lentils, Red Kidney Beans and Indian Spices Gravy). India is not only popular because of it’s vegetarian recipes but non-vegetarian delights equally rule over the heart of millions. I am preparing Chicken Dopiaza today, wherein Hindi language “Do” means two and “piaza” means onion. 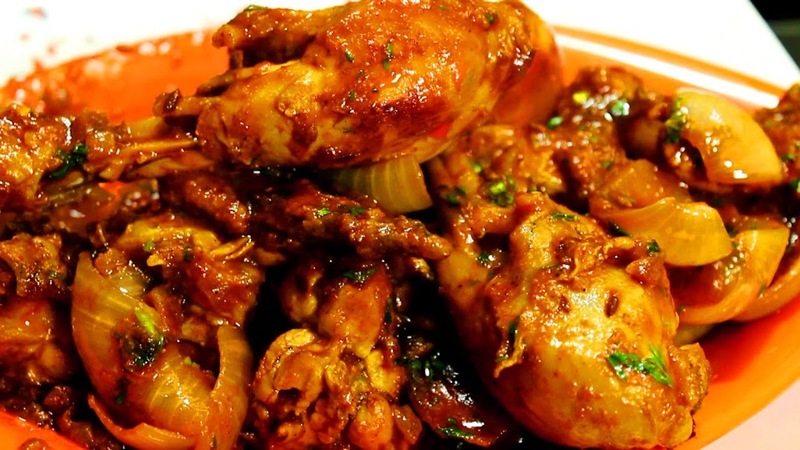 Nevertheless Chicken Dopiaza is all about the rich chicken gravy with prominent flavors of onions. Not only this but “Lamb Dopiaza” is one of the most demanded curries in Indian homes and restaurants. I have used Garam Masala (Indian Powdered Ready-made Spices) here. It is available on general stores pretty easily. I also have a remedy for it if it isn’t available. Garam masala is powdered mixture of black peppercorns, cloves, cinnamon, nutmeg and mace, black and green cardamom pods, bay leaf and cumin seeds. Hence you can prepare it easily at home to enjoy real flavors of any spicy Indian recipe. I have already kept a bottle at my home, you don’t require grinding these ingredients each time. Just like Dal Makhni, this recipe is best paired with Naan (oven baked flatbread), lacha parantha (multi-layered fried North Indian flatbread) or steamed rice, if you are a rice eater just like me. I also like pairing it with Dry Fruit Fried Rice or Kashmiri Pulao. You must try this recipe also, rice lovers are gonna love it, I can bet. Let’s add some more colors and spice on the India’s Independence day with “Chicken Dopiaza”. 1 tablespoon Cumin Seeds Powder. Blend onions, ginger and garlic. Set aside. Take a pan and heat oil. Put in the sliced onions and fry until golden brown. Remove the onions and set aside. Remove pan from the heat. Add the blended onion paste. Place the pan back on heat. Keep stirring the paste for 3 minutes, till it turns golden brown. Add coriander, cumin, turmeric plus chilli powder. Stir well. Add in two tablespoon of yogurt. Mix well. Add chicken. Stir for a minute. Let chicken be well coated with the spicy mixture in the pan. Add in tomatoes and salt. Stir thoroughly. Cover and simmer for 20 minutes. Sprinkle over garam masala and fried onions. Cook till the chicken is completely cooked. Serve with naan, lacha parantha or steamed rice. Like the cultural aspect of it! I love this post, this is my favorite food.